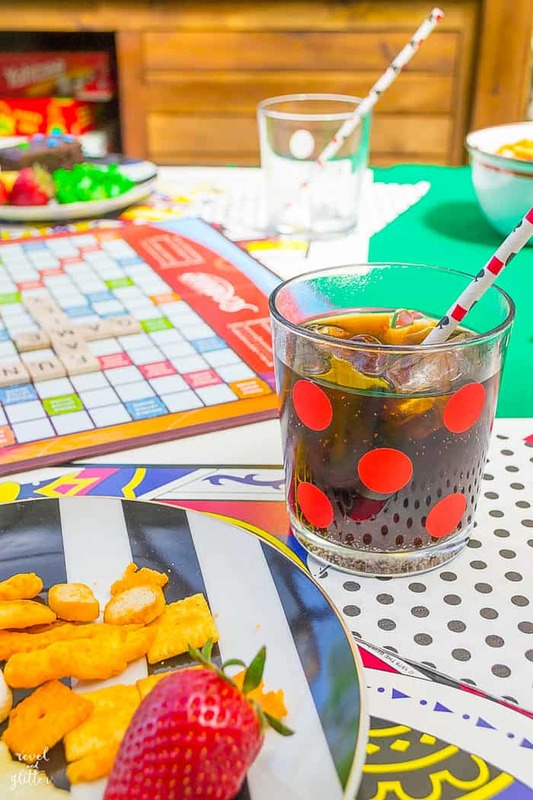 This game night ideas post is courtesy of our contributor Dawn of Revel and Glitter…Remember my last Board Game Night post? It was my inspiration board to creating a fun night with family and friends. Life can get so busy so slow things down and enjoy some quality time. 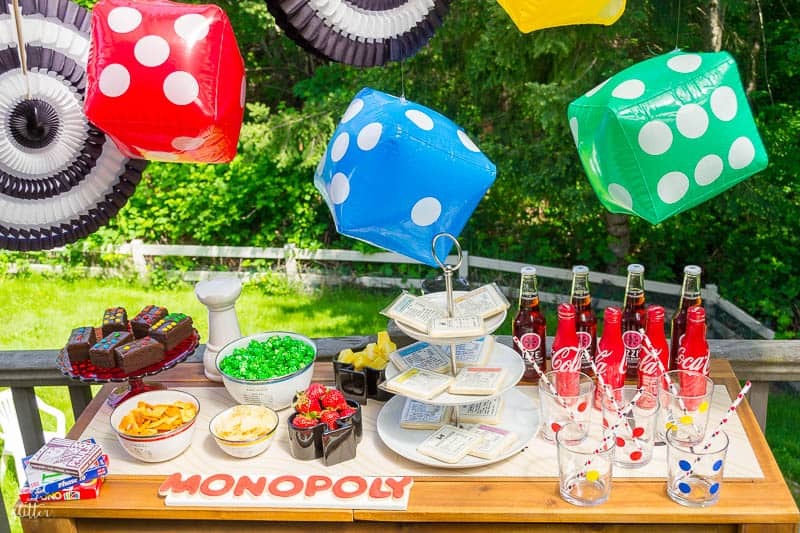 I’m sharing a few easy and creative ideas that are simple and budget-friendly and will make your family game night feel special but come together quickly. 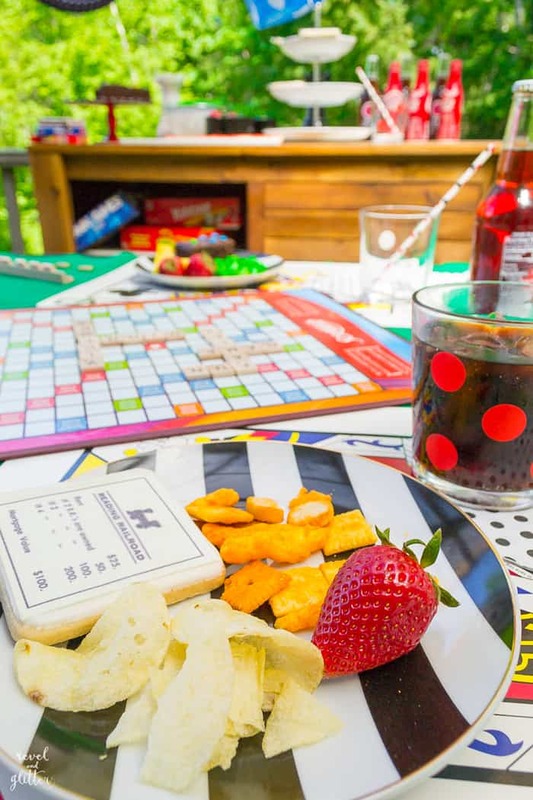 With summer weather around the corner, mix things up and take your game night outdoors! 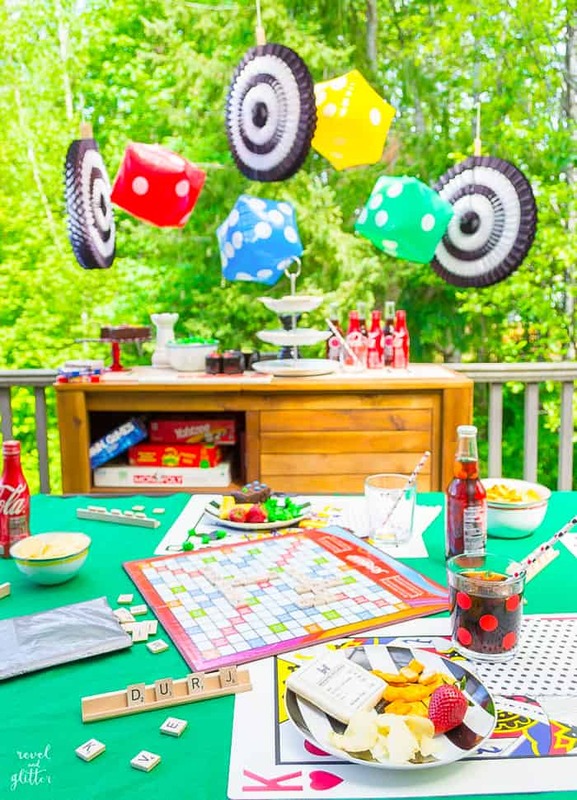 Stack the odds in favor of a good time with yummy snacks and a playful setup – everyone’s a winner! 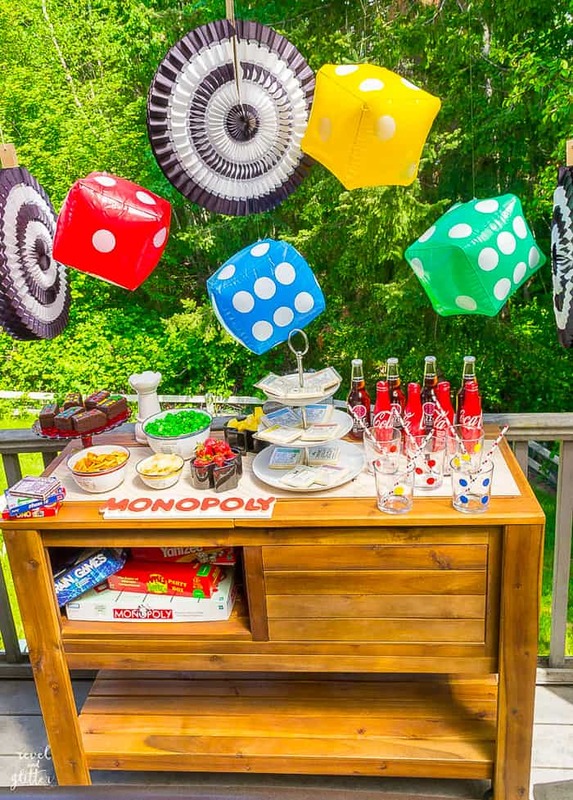 These inflatable yard dice from Target, combined with black and white paper fans, were the perfect backdrop for our buffet. Shameless plug, I absolutely love my new cooler cart from World Market! 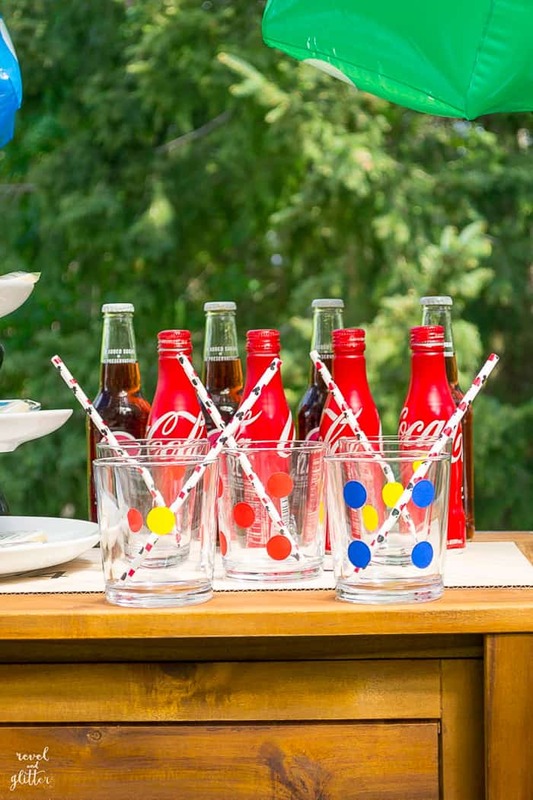 It is so summer-entertaining ready! 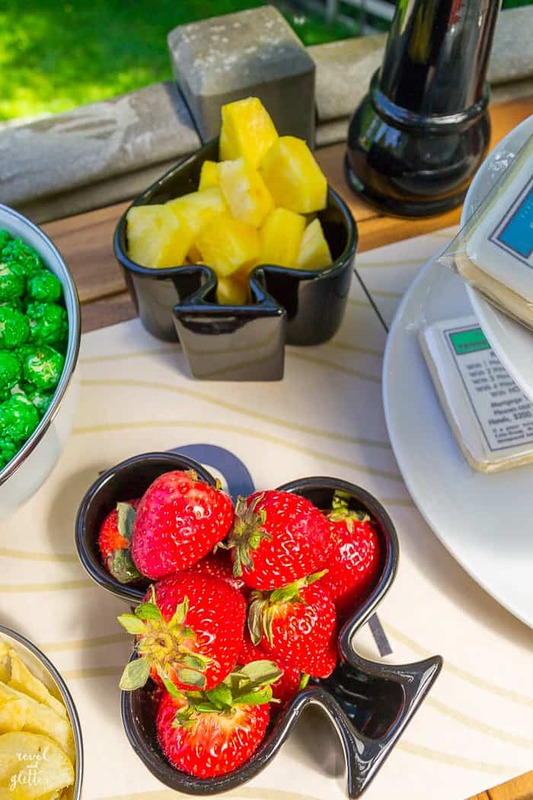 It’s easy to serve simple snacks and have a little fun with them. 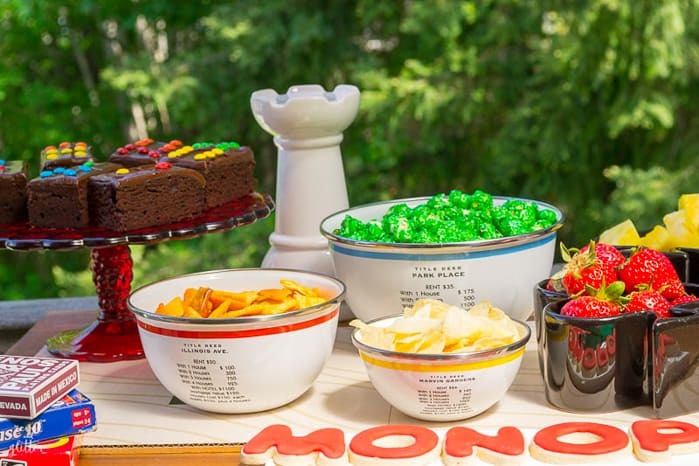 Serve popcorn, chips and other treats in themed bowls. 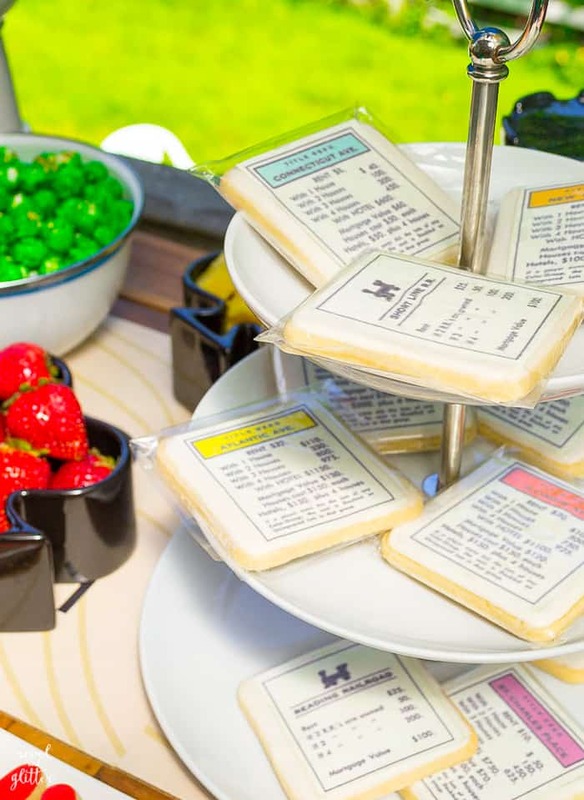 My fancy cookies are courtesy of one of my favorite bakers, but you can serve checkerboard cookies or Pepperidge Farm classic Chessman cookies instead. 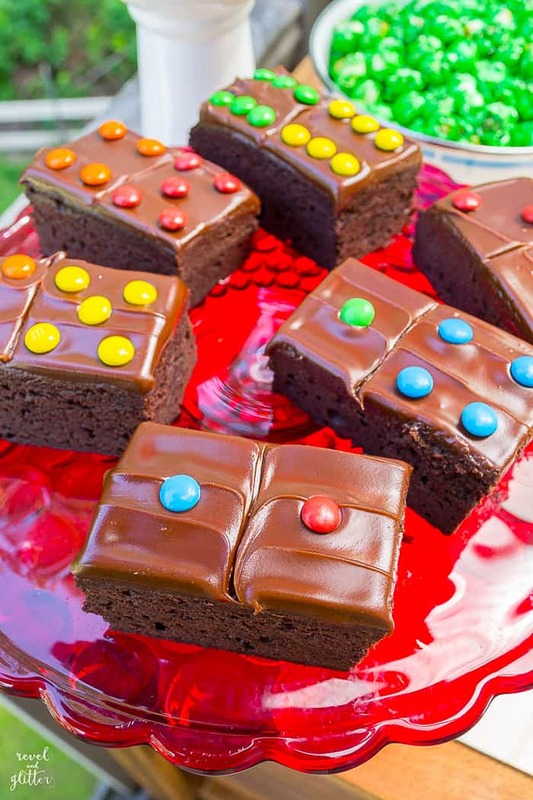 These domino brownies are easy to decorate. Simply purchase frosted brownies or make them yourself. With a sharp knife, cut brownies into rectangles. Use a toothpick to score across the center of each frosted brownie to create the divider line. 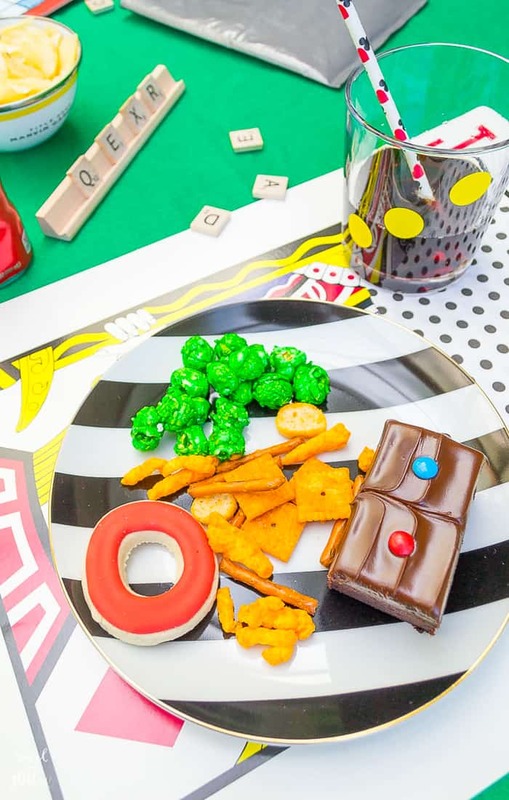 Add mini M&Ms to mimic domino dots. Turn glass tumbler glasses into dice cups! All you need is round color coding stickers found in the office supply section of any grocery store. Peel and stick to mimic the look of dice. Use an inexpensive green felt fabric to use as a festive table runner. Giant playing cards purchased at a party supply store serve as placemats. 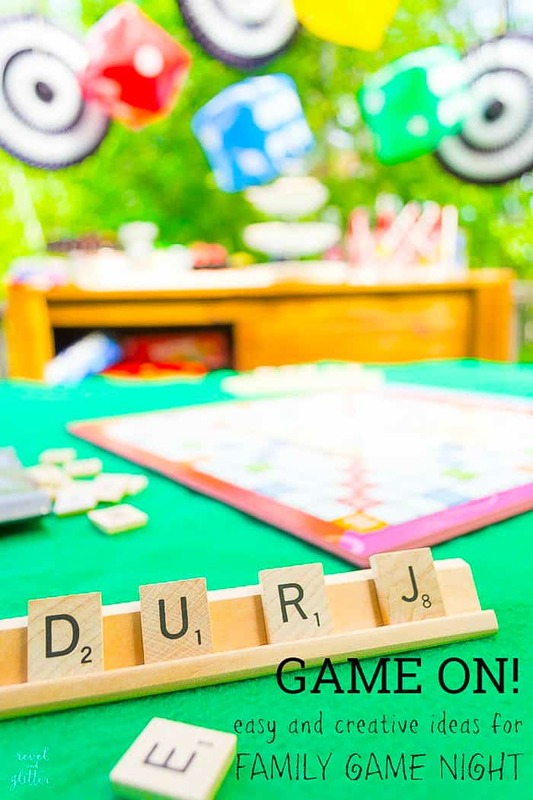 Have a variety of games available for use and double duty as décor. Set your music player to appropriately themed music from ABBA’S “Take A Chance on Me”, Frank Sinatra’s “Luck Be A Lady” to The Rolling Stones’ “Tumbling Dice”. 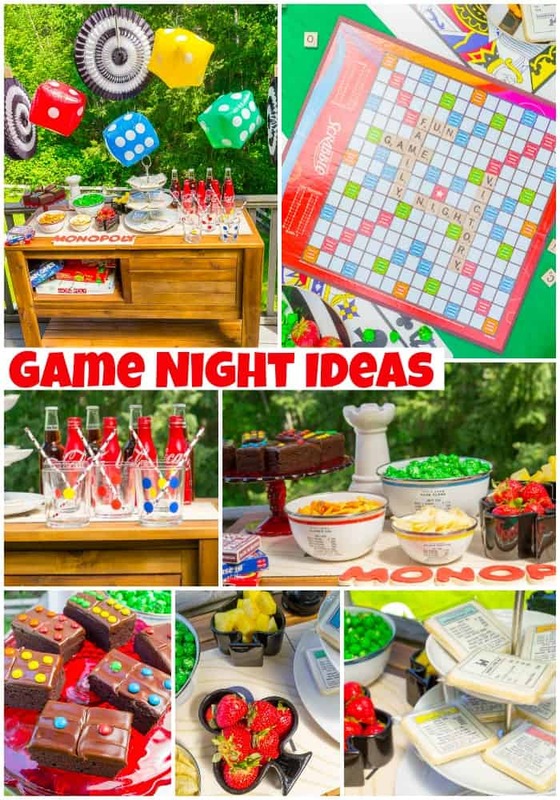 Hope you are game night inspired! Need more quality time ideas? I’m a big fan of movie nights. 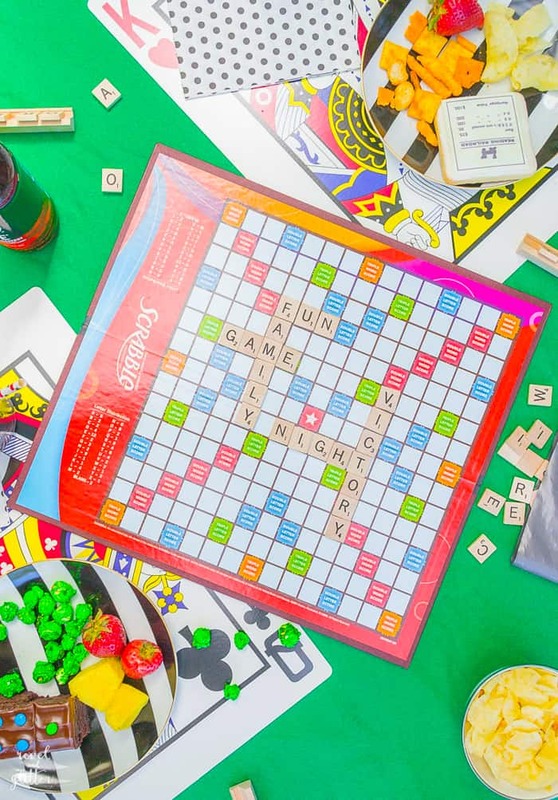 What’s your favorite tip for hosting family game night? Tell us in a comment below!